Disclaimer for singles: this post is hopelessly romantic and “couples oriented.” That said, there’s nothing to stop you from getting a dozen Blue Points and some prosecco, whipping up these sauces and treating yourself to a private showing of Sleepless In Seattle. Or The Empire Strikes Back. Whatever floats your boat! 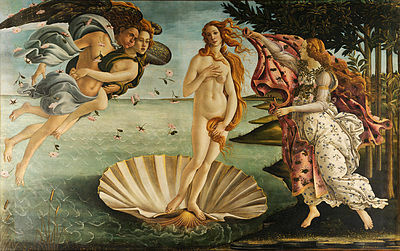 Botticelli’s The Birth of Venus (the Roman equivalent of Aphrodite). Orville and I saw this painting in Florence last year! – Aphrodisiac? Absolutely! This special Valentine’s Day post is really just a heads up to one of the best kept secrets in NYC (and probably where you are, too, especially if you have a Whole Foods or a good fish market nearby! 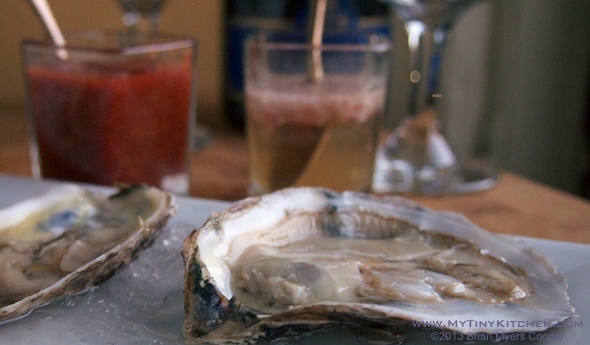 ), plus a couple of recipes for the classic accoutrements: mignonette and cocktail sauces. Citarella, Fairway and Whole Foods will sell you a dozen Blue Point oysters, shucked and presented on the half shell nestled in a bed of crushed ice for less than $20 (Whole Foods may be a little more)!! Really. All you have to do is bring home their tidy little package, pop open an inexpensive bottle of effervescent prosecco or cava, serve alongside these homemade sauces and watch the fireworks begin! If you’re hungry (and not already inspired to dive into a different activity altogether!) Try this Cioppino Angel Hair Pasta, and maybe finish the meal off with a Chocolate Rose Martini! I pull out the oyster card a lot – we had them just last week for Orville’s birthday. They make any occasion seem extra special and romantic for a fraction of what you would pay for the exact same thing in any decent seafood restaurant. Plus you’ll be closer to the bedroom should the oysters work their magic juju and put you in the mood! Mix all the ingredients in a small bowl or jar. Allow to sit for a few hours for the favors to blend. Mix all the ingredients in a small bowl or jar. Refrigerate for a few hours to allow the favors to blend. Could that be any simpler?